Cravings. We all have them. Some people strictly crave sweets and others like the saltier things in life. Me? I go back and forth. Most of the time I crave a combination of both, but when a specific craving hits — it hits hard. If my sweet tooth decides to make an appearance, I know I better make room for something seriously decadent to come through, usually in the form of the one and only — Chocolate. Chocolate is front and center of these rich, gooey, dense fudge-like brownies topped with a dark chocolate ganache and studded with hot chocolate flavored Milky Ways. Hot Chocolate Milky Way Brownie Pie totally satisfied my chocolate cravings, and I’m 100% positive it’ll take care of yours too. I’m not the only one with a craving — the #SundaySupper crew has plenty. That’s our theme for the week, Year End Cravings. We’re sharing recipes for things we have been craving all year long and are finally getting a chance to indulge. For our last #SundaySupper post of the year, we are going all out. Thank you to today’s host, Cindy of Cindy’s Recipes and Writings. I can never pass up holiday-themed candies. I found Gingerbread Twix and Hot Chocolate Milky Ways at CVS the other day and snatched them up. Immediately my mind starting going in a million directions thinking of all the ways I could use them. When I was putting them away, a bag of marshmallows fell out of the cabinet, hitting me in the head and knocking an idea right into it! Marshmallows and hot chocolate are like the All American Couple. Or is that peanut butter and chocolate? Okay, so we have more than one All American Couple in the food world. Whatever. Marshmallows + Hot Chocolate = Heaven. Hot chocolate is something I always think about making but never do. It’s one of those cravings that I don’t even know I have until the smell of warm chocolate is wafting through the kitchen and I see little marshmallows bobbing around in a full mug. 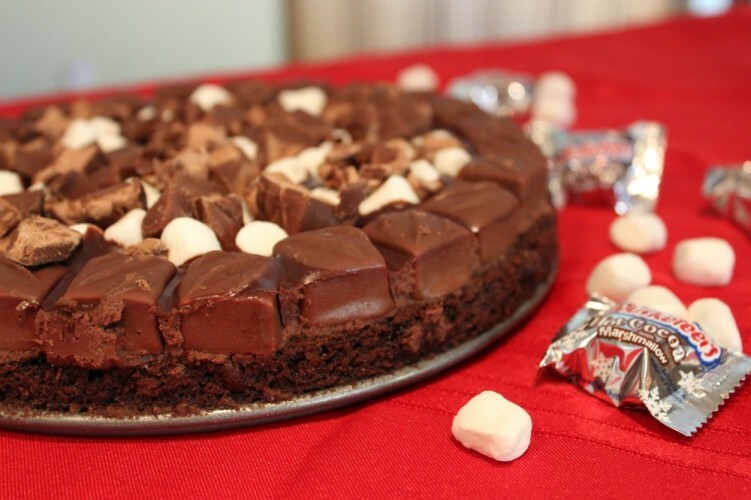 Hot Chocolate Milky Way Brownie Pie makes the rest of the brownies you made this year look amateur. Even the ones you made from scratch. Because, yes, I admit it. I cheated and used a boxed mix — but that’s only because there was dark chocolate ganache to be made and lots of little Hot Chocolate Milky Ways to unwrap. Sometimes short cuts are acceptable, and this is one of those times! Plus, boxed mixes are pretty freaking delicious, especially when you get all crazy with the rest of the ingredients in your dessert. I baked the brownies in a 9-inch spring form cake pan to give it a pie-look, and sliced it up into slivers. I promise, a sliver is all you need. The brownie base to these Hot Chocolate Milky Way Brownie Pie is suuuuuuper rich, not to mention covered with a generous layer of ganache and LOADED with lots of chopped up Milky Way. 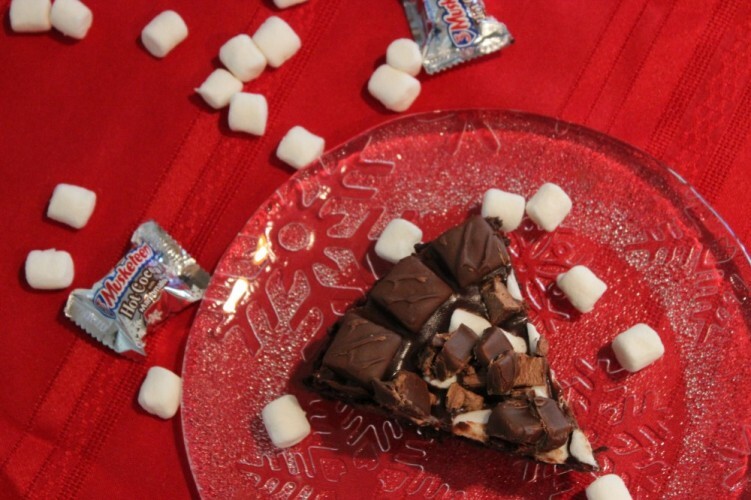 There are three days left in 2014 — please make this Hot Chocolate Milky Way Brownie Pie before you start on your healthy eating kick come next week. Chocolate is front and center of these rich, gooey, dense fudge-like brownies topped with a dark chocolate ganache and studded with hot chocolate flavored Milky Ways. Prepare brownies according to the box instructions. Bake in a 9-inch round spring-form pan. While brownies are cooling, make the ganache. Break up the chocolate bars into pieces and put into a deep heat-proof bowl. Heat heavy cream on the stove over medium-high heat until it begins to simmer. Pour the cream over the chocolate and let sit for 1-2 minutes. Use an immersion blender to pulse until the mixture is smooth and creamy. Pour the ganache over the brownies and immediately line the edge with the Milky Ways. Allow to set in the refrigerator for at least 3 hours before serving. And you’ve got to check out the rest of my #SundaySupper friends’ recipes too! Beautiful brownies, Shaina! I could eat the whole pan! Oh good golly what incredible brownies! I have a secret addiction to those mini Hot Cocoa Milky Ways. 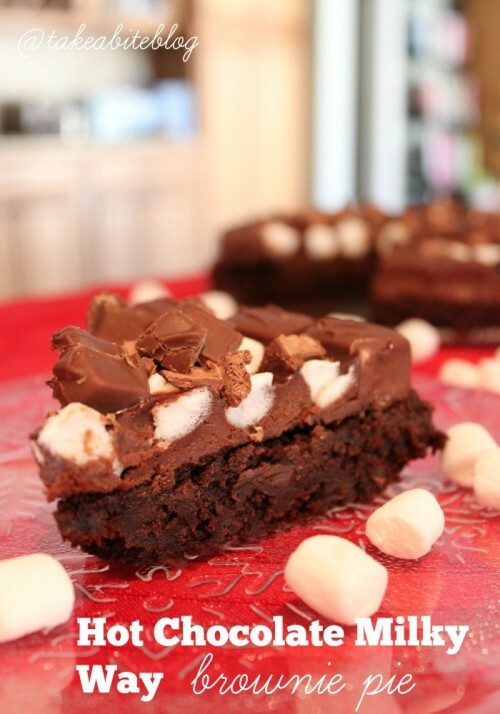 This is like my dream brownie right here! Heather, this was the first time I ever saw them!! They are delicious! Get out of town…this is seriously amazing…and I need a big big big slice in my life immediately! KATIE, yes you do! This a nice big glass of red wine. Perfect! I think I could crave this all year! YUM! This would def be an end of the year indulgence that I can get behind! This is such a fun idea! Can’t wait to try it. Good Golly! 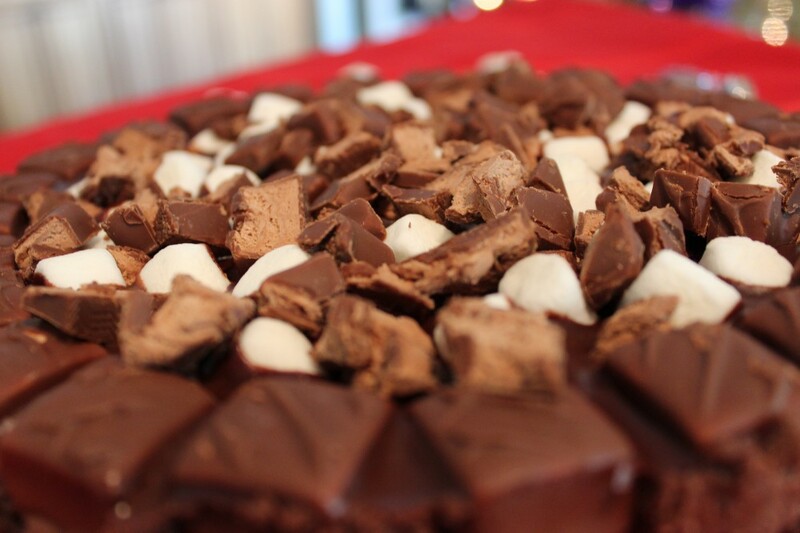 That is a whole lot of chocolate going on! I may be in a chocolate coma just looking at that brownie. That is definitely a dessert for the chocolate lover. Oh yea, Christy, it’s a chocolate lovers dessert for sure! Happy New Year to you as well! Now that’s what I call a brownie Shaina. Love it, all of it. Tee hee. 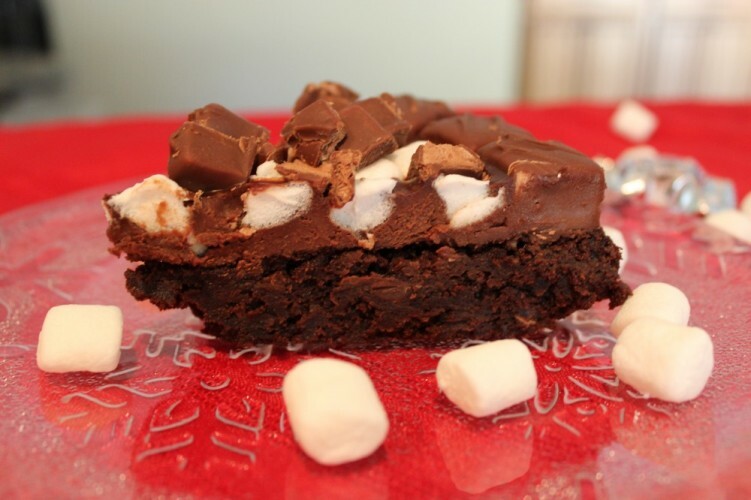 The marshmallows fell out of the cabinet…Guess it was meant to be =) And your brownie pie does look fantabulous, Shaina. P.s. Nice to know there are gingerbread Twix. Yess, Kim, Gingerbread Twix..who knew?!? Cathy, are there any other kind?! I’m going to make this for New Years EVE – looks DELICIOUS!!!! This dessert is just phenomenal. Really, really irresistible and crave-worthy!!! This is a party in a pan! Oh my goodness, it looks amazing! Wow!! With this around I’d never want to START the healthy eating of the new year! Oh wow, talk about decadent! That looks fabulous! You had me at brownie pie! That is some serious yumminess there! So glad you shared it with us at Foodie Fridays! Pinned! Thanks, Michelle!! If you like chocolate, you’ll love this!